The sweet tooth fairy attacked today. Seems I was craving not only chocolate, but also something extremely sweet. I told myself that if I made it myself that it couldn’t be as bad as eating a candy bar. Yeah, that went over well. Particularly the moment when I put a candy bar into the brownie batter that I made. 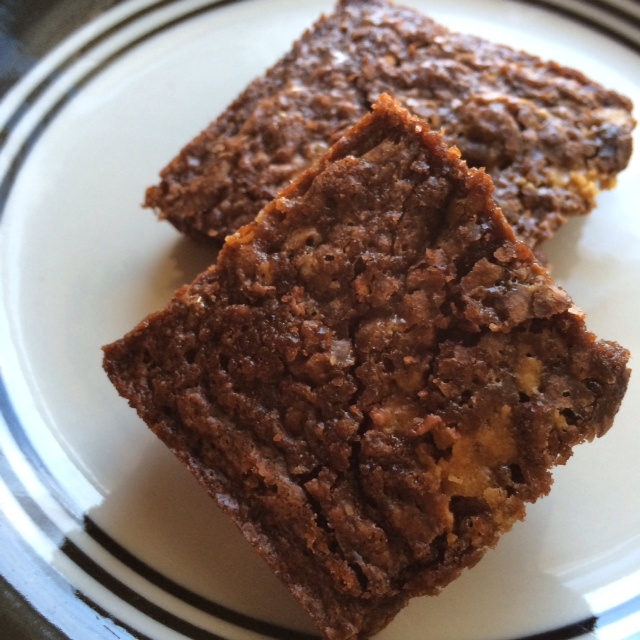 Guess I just came up with my own version of Butterfinger brownies. Super simple, super sweet, and probably gave myself a cavity just by inhaling the chocolate fumes coming from the oven. So… we’re starting that diet next week, right? In a large bowl, combine brownie mix, oil, water, and egg. Take a rolling pin, and while Butterfingers are still in their package, lightly tap until broken into small bits. Add one of the mini Butterfingers to the mix. Stir. Pour brownie batter into a greased baking pan, preferably an 8×8 pan. Smooth and the evenly sprinkle the remaining Butterfinger on the top of the batter. Place pan in oven and bake for 20-25 minutes or until you can stick a toothpick in the brownies and it comes out clean. Let cool for 15 minutes. Remove from pan, slice, and serve. For more sweet recipes, visit my Recipe Index.